Praan Naturals supplies a growing range of premium quality natural exfoliants that are suitable for use within facial, hand and body scrubs, polishes, soaps and other skin care formulations. Natural exfoliants help to gently polish away rough and dead skin. Each exfoliant varies in the degree of exfoliation that it offers. Our nut and seed meals, for instance, provide moderate to aggressive exfoliation while also imparting the nutritive benefits of the natural oil content contained in the meal. Fruit fibers provide mild exfoliation and can be used in facial products or products for sensitive skin types. 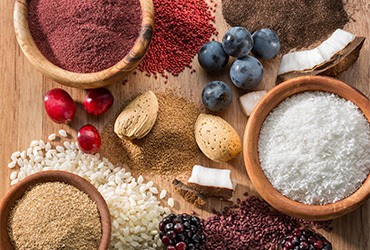 Coarser grains, such as salts, sugars and pumice, are best suited for hands and feet.